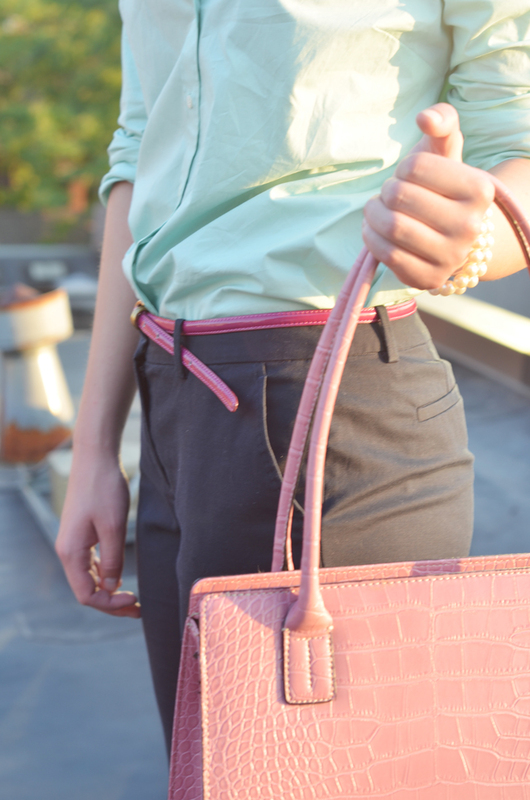 Cropped trousers with a flattering cut and a classy shoe can work well on taller women. Just make sure the hemline is level with the lower calf—not the widest part. You may need to shop around for the right fit for you. And yes, I'm on a roof! Here’s another knee-length dress for you! As I mentioned in my last post, this length and style dress is flattering on tall women. Regarding the horizontal stripes―lately I’ve been doing some research because I wasn’t convinced that they make you look wider. There are some very mixed opinions out there including the theory that horizontal stripes actually make you look thinner. Crazy, right? See article here. My verdict? I think it depends on a lot of factors (width of stripe, color, etc. 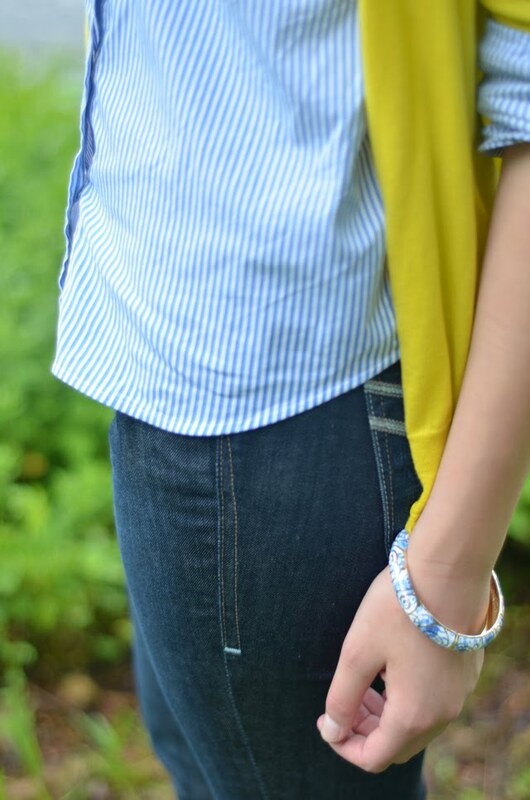 ), so if you like horizontal stripes, just wear them! 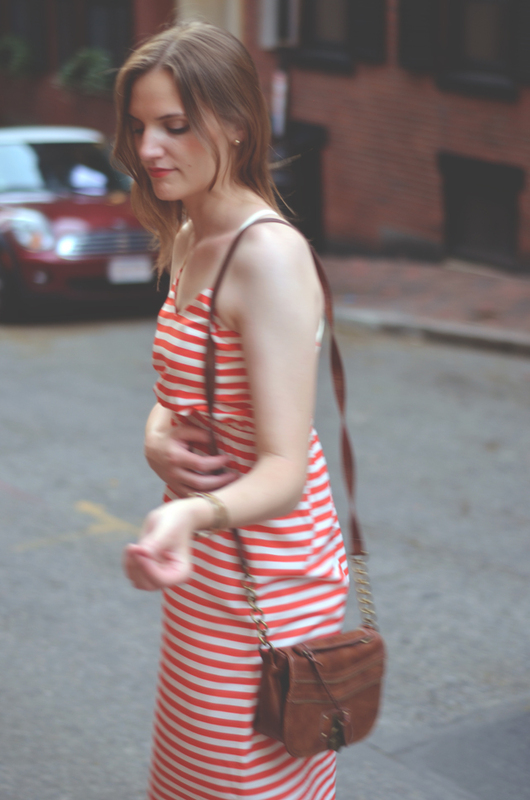 I fell in love with this dress, even though it had horizontal stripes. The outfit would look better with a nice pair of summer wedges, but alas, I'm wedge-less. Let me know if you have any recommendations! 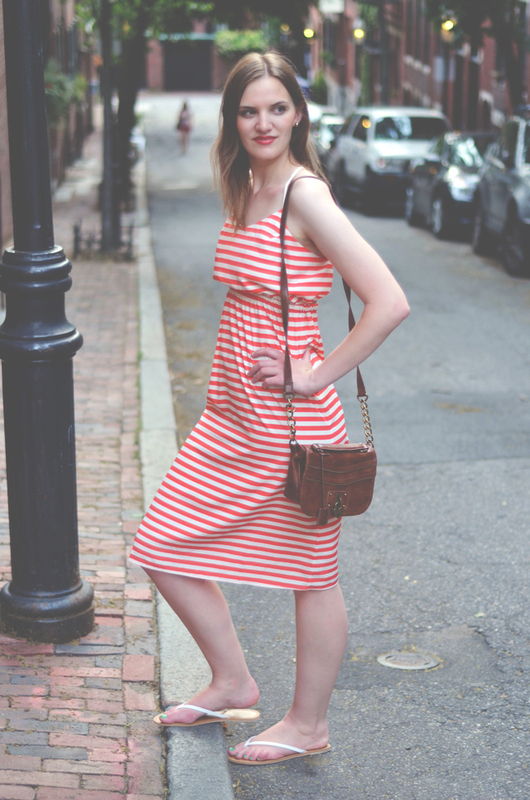 What are your thoughts on horizontal stripes? I bought this dress from Piperlime last year on a whim and haven't worn it since. At 26" long from the waist, it's supposed to hit just at your calves. But I always found that length to be a bit awkward on me. This year I figured out that I could move the elastic waistband up higher, hence making the dress hit just at my knees. The results? Much better! I think the proportion and silhouette of the dress works well on taller women (especially pear shaped taller women like me!). It elongates the body, but doesn't cut the legs short. It nips in at the smallest point, and then flares out to hide flaws. **I'll do a post soon about dress lengths on tall women. I'm still looking for a good maxi dress, so if you have any suggestions, please let me know! I chose not to accessorize with this dress as I felt that the sparkly gold feather embellishment was enough. I love the simplicity yet sophistication of this look. Also, this dress is 100% silk. Luckily it was windy out, otherwise I would have needed a slip. The dress did tend to cling to me. Flats look the best with pants, especially with straight-legged pants or pants with a tiny flare. But don’t wear flats with pants that are too long. You'll end up looking sloppy. If you’d like to wear flats with a dress or a skirt—especially a pencil skirt—opt for the pointed-toe styles. 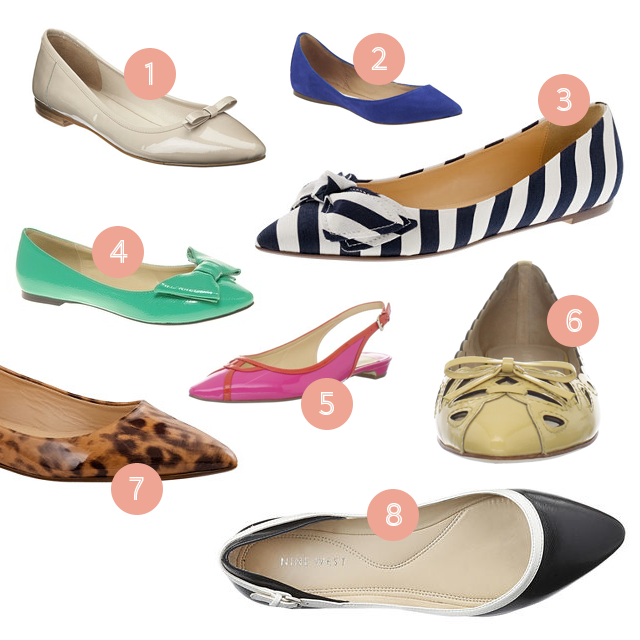 You’ll see in the photos above that the pointed-toe flats look better than the rounded-toe flats. That's because the pointed-toed flats have a similar effect to wearing heels. They help elongate the leg rather than cutting it off short like the rounded-toe flats do. They've also got a fancier feel than their round-toe counterparts and can help you obtain a more business oriented look. If you have to wear rounded-toe flats with a skirt or dress, make sure you wear them with a shorter skirt (more than an inch above the knee), since having no heel or point can make legs look shorter. Showing a bit more leg helps to get that length back. See an example of how I pulled it off here. And come Fall, don't be afraid to pair a short skirt and flats with tights! I do it all the time. See an example here. 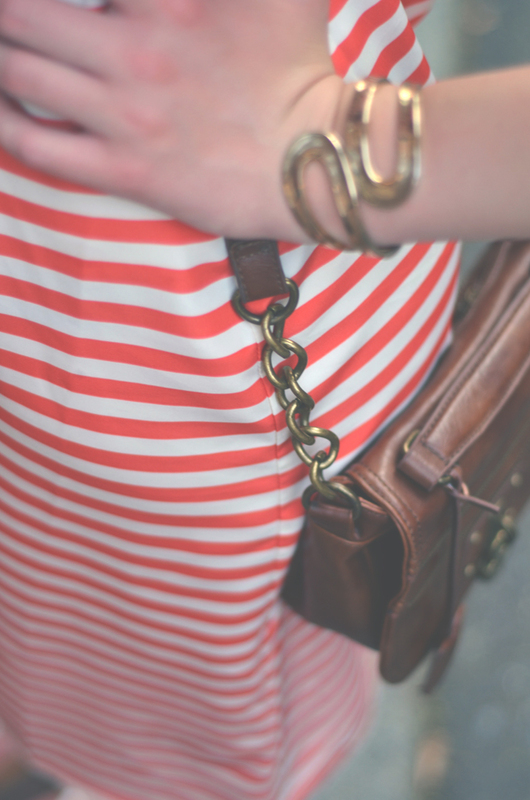 Don’t wear any flats with skirts or dresses that fall below the knee—you’ll achieve a frumpy silhouette. What do you wear with your flats? Freshman Year – I didn't have rain boots. My socks always got soaked when walking to class in the rain. It was miserable. Sophomore Year – I bought some crazy polkadot rain boots from Target. They looked something like this, but had white dots and were hot pink inside. I think my college roommate bought the same pair. Clearly I was on a college budget, but I desperately needed something to keep my socks dry. 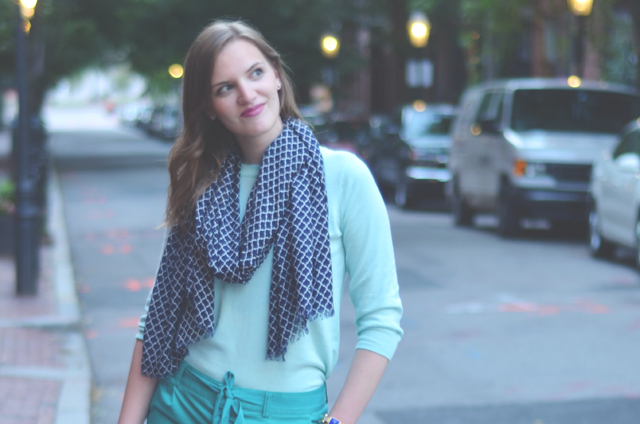 Junior Year – My crazy polkadot rain boots died. 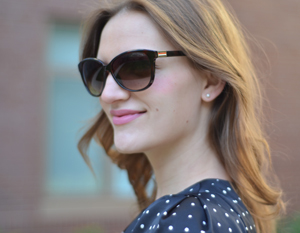 I tried another pair of Target specials. Senior Year – My second pair of Target rain boots died. I suffered the rest of the year. Year After College – I bought some horrible green and blue Chinese Laundry rain boots. They were cute in concept, but were way too short on me. Not only were they impractical (i.e. I couldn’t stomp through puddles without getting my pants wet), but they also did nothing for my proportions. I definitely got some weird looks commuting to work on the subway. Color: I'm not really sure why I went with this color. It's a little drab, especially to wear on a rainy day. I wish I had opted for a brighter color, like a green or even a yellow. Style: I like these boots because they feel more mature and sleek than my previous pairs. Although, don’t get me wrong – I did love my crazy polkadot rain boots from Target! 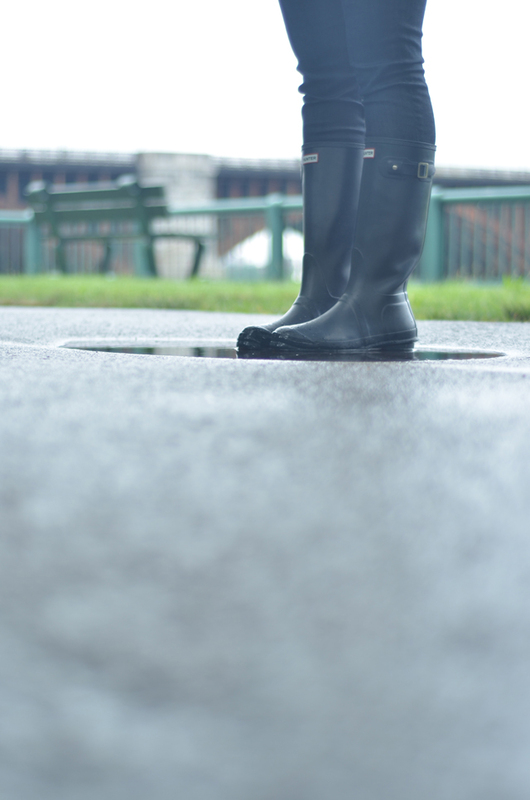 Height: These rain boots could stand to be a good two inches longer. The shaft height is only 14", which may reach the knees of a petite girl, but not on me. Circumference: The fit is a bit tight. They fit over tights no problem, but sometimes it’s tough to pull them over a pair of skinny jeans. I find that tucking your jeans into long socks helps with the bunching. At the widest point, my calf has a 15.5" circumference. Hunter rain boots claim to have a 14.5" calf circumference. You can see how snug they are on my calf in the photo above. Hunter rain boots do come in wide calf, which means a 16.5" calf circumference. Functionality: These rain boots are extremely practical. The longer shaft height combined with the tight fit prevents me from getting wet. And if you're wondering if I splashed around in the puddles today...the answer is YES! I just discovered that some retailers sell shorts in tall sizes and I think the whole concept is kind of strange! Why do they sell tall shorts when they can simply sell shorts in different inseam increments? Maybe it's a marketing thing—it certainly worked on me! I had to try a pair, so I ordered some tall shorts from Banana Republic. According to the website, the difference between a regular and tall size for these shorts is an inch. In reality, these shorts still feel (and look) really short on me, but having an inch less of fabric would look even more ridiculous. I'm not much of a shorts person anyway. I much prefer skirts and dresses in the summertime. Have you tried tall shorts before and had success? I always bought capri-length yoga pants because I could never find any that were long enough for me. UNTIL NOW. I recently discovered that Victoria's Secret carries long sizes for yoga pants. The best part? The yoga pants shown above come in up to 5 different inseams! I've already tried the Yoga Foldover Pant in both the 34" and 36" inseams. The 34" pair was perfect for running—long enough, but not so long that I'd trip. The 36" pair was way too long for me. Great for hanging out around the house, but not practical. I'm about to order the Most-Loved Yoga Pant in the 34" inseam. At $25 a pair, you can't beat it. I'll let you know how they fit once I get them!